Home > Daily Banking > Why Are Cheques Being Phased Out? Cheques have been in use for more than 350 years, but they now appear to be on their way out as the internet and other forms of electronic payment bring us closer towards a cashless society. But what does this mean for people who rely on cheques? 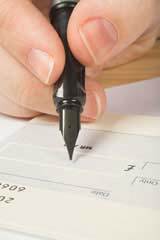 In the Netherlands, the cheque is no longer used at all. Its use is also rare in Belgium, Germany, Switzerland and Sweden. But it is used much more commonly in the US than in the UK. The tide began to turn in 2007, when cheque usage fell to its lowest level in the UK. It was calculated that personal cheques accounted for only 6 percent of all personal transactions that did not involve cash. Many retailers no longer accept cheques and consumers have been increasingly using online transactions and electronic payment methods to pay for goods and services instead. This led the payments industry to announce that the chequebook was officially to be consigned to history, and they began to make plans to phase the chequebook out by 2018. These plans, however, have faced a backlash this year, as cheques have returned to popularity with cash strapped consumers, and also because of security concerns surrounding the alternatives. So why are cheques being phased out? Unsurprisingly, a major reason is the costs for banks and other financial institutions. The move away from cheques and cash has not been as rapid as the industry originally expected. In the mid-noughties estimates were that non-cash electronic payments would overtake cash payments by 2011. Now, this has been pushed back to 2015. These institutions have been investing heavily in the latest microchip technology that allows customers to use their credit and debit cards to activate a payment simply by pressing their card against a sensor; similar to the Oyster travel system operated on the London Underground. Mobile phone payment systems are also being heavily touted as the ‘next big thing’ for non-cash payments, whereby if, for example, you want to pay for a service such as an electrician you can do so by exchanging text messages via telephone numbers that act as bank account details. So far, however, these new technologies have failed to capture the public imagination, with one of the biggest concerns security. Many people fear that if their bank card or mobile is stolen by sophisticated thieves they run the risk of having their bank account cleared out. Payment companies have therefore tried to limit the amount a customer can lose on these forms of payment. For example, a contact-less card will usually have a transaction limit of around £10, and where a higher limit is applicable the cardholder will be required to use a Pin number before the transaction will be authorised. So far, these measures have yet to convince the public, but the use of contact-less cards is on the increase. Charities such as Age Concern have also protested against the phasing out of cheques, rightly pointing out that many more mature people are not comfortable with using these new technologies. They have argued that paper-based forms of payment such as cheques should not be phased out until suitable alternatives for people of all ages are agreed upon. The Government appears to agree, and recently announced a formal inquiry into the proposed abolition of cheques and publicly stated that cheques will only be phased out if adequate alternatives are in place. They also accepted that cheques are still widely in use for sole traders, skilled tradesmen, small businesses, charities and schools. @Hashcripple - how very annoying for you. At least you got the money which is a plus. The cheque I presented bounced and I've done a week's work for no pay - unless I pay to take it to the small claims court! I agree with Mimicme and AJtheshrewd. The sooner cheques are discontinued the better. As a sole trader I am occasionally paid with a cheque. A recent example was a job completed to the customer's satisfactionat a remote location. It was agreed topay by cheque. The cheque arrived in the post the next day. A good start. The branch of my bank is in the next town. I drove to the bank to pay it in but the bank refused to accept it as it was incorrectly filled out. I phoned the customer who apologized and said he would send a replacement. That arrived in the post the next. Another trip to the bank to pay it in. As the cheque was drawn on a foreign bank account I was told it would take a week to clear. It did clear eventually. The whole process to get paid had taken 10 days and cost me time and car mileage. Cheques are horrible, trying to run a business and having to go to the bank everytime one turns up instead of when we receive payment via bacs is a nightmare in our rural area where the banks have all shut. How can we bank cheques with no branches. Cheques don't clear for days and despite hammering home the point that we need cleared funds client still send cheques that will not clear in time for their service. We get charged to bank cheques but not for bacs payments. Early days of this business we had a client pay a cheque into our bank which failed to clear and we lost thousands. This was early on and we did not realise that even when there is time for it to clear the bank does not notify you of a bounced cheque for quite a while after that by which point its way too late and you have already provided the service. Why keep a system that allows to basically give someone a piece of paper that is worth nothing as no one knows until the bank tries to clear it. The client can also cancel a cheque as long as it hasnt been cashed. We might aswell be writing an IOU on a slip of paper for services or goods. That is exactly what a cheque is. I appreciate the elderly are perhaps not tech savvy nor may even own a computer and that is where a travellers cheque type system from the post office/banks should be available. You should be able to pay for a post office/bank cheque which is guaranteed to clear as the customer has already paid the cost of the post office/bank cheques in branch. Failing that cash should be used. @Lisamarierbrown - what if a ransomware virus hits one of the banks? No one has got a fall-back plan and that's where a pen and paper are the most trustworthy. We need to keep cheques for at least another 10 yrs in my opinion. I haven't used cheques for many yrs but elderly relatives of mine find them an essential form of payment. Older people find getting out to banks or cash points difficult and without Internet access or mobile phones, cash or cheque, is the usual payment method for many. Get rid of cheques, these historic banking methods are adding additional banking costs to those of us that have been bothered to keep in touch with progressive developments in technology. I understand the need of banks to remove this expensive transaction method, however, there is a large number of elderly people, including my mother, who have no internet access, no mobile phone and no intention of ever having either. Despite having money many elderly people have very little credit history because they have not used credit cards in the normal way and prefer to pay as they go. It would seem reasonable to keep cheques until say 2030 (by which time all of the living should be computer literate), even if there is a necessary charge associated with cheque usage. Alternatively, the banks should be educating their elderly customers and advising them of the alternatives available and teaching them to use them. My mother has no inkling that this change will happen because she does not look at the web or other "hi-tech" media sources.